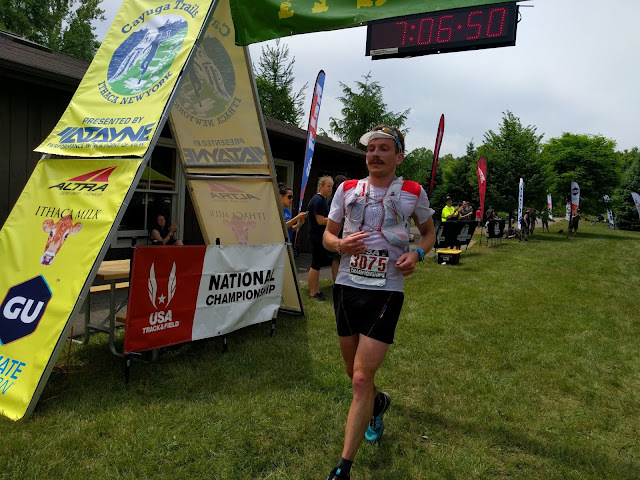 Coming off of Lake Sonoma 50 in early April, I had 8 weeks to put in a good training block for Cayuga Trails 50, which served as this year's US 50 Mile Trail Championships. The hope was to be in top form for a mid-year peak before taking a short break and moving on to big fall goals. But you know the way with best laid plans... Unfortunately, between some nagging minor injuries and a little bad luck in getting ill for a week+, the training was mediocre at best. On the injury front, I've got two minor things going on: (1) my left Achilles is a bit chronically swollen (kind of a bursitis thing going on), so I've got to be pretty careful monitoring that, and (2) my first metatarsophalangeal joint on my right side is a little beat up and immobile. The Achilles/bursitis deal hasn't been too bad and it's something I can manage pretty well, though I could certainly be more diligent in doing loads of concentric and eccentric calf exercises (both leg straight and with knee bent). The toe however kept getting aggravated while I was playing indoor soccer (which I probably shouldn't have been doing in the first place!). Combined with the pounding of Lake Sonoma 50—downhill pounding seems to aggravate it even more—along with a hill workout a couple weeks after, I actually had to take a week or so off to let swelling come down and at least some mobility to return. It's not perfect right now, but it's much better. The risk with the limited mobility is that I'm doing weird things during pushoff and thus risking some other injury developing through improper mechanics. Ahh, the runner-injury-avoidance dance... does it ever end? OK, enough complaining—overall I'm in fairly good health and I'm actually really excited about my race this weekend and where I'm headed from here. The simple reality of the injury/illness situation was that I wasn't feeling very fit or confident coming into Cayuga Trails. My weekly mileage averaged less than 50 mpw in the two months prior, with very few workouts and a longest run of only 16 miles. Far from ideal. However, if I've learned anything in the last year, it's that I can actually run fairly well on limited fitness, such is the nature of ultras and old man strength. I just try to accept my current situation and keep a positive outlook and realistic expectations for race day. For this weekend, that meant being more conservative than in years past (I ran this race in 2013 and 2014 as well). 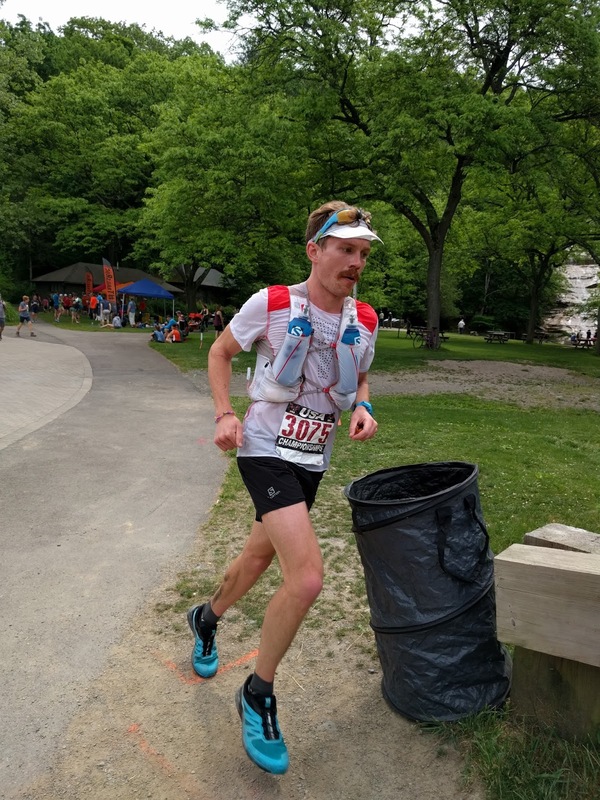 I developed a conservative pacing strategy that would take me through halfway in 3:20 or slower (I had gone out in 3:12/3:13 in two previous outings). I knew this would likely mean letting a number of folks get away, and I'd have to hope to chase some of them down on the second loop (the course consists of two 25-mile out-and-backs). At the Underpass AS around mile 8, I moved in front of several runners, including Ben Nephew, while they refueled. After a waist-deep creek crossing, I mostly power-hiked the steepest climb on the course before gradually bridging a gap to Brian Rusieki. Brian and I ran together for several miles, eventually catching up to two newbies as we approached the descent to Buttermilk Falls AS and the 1/4-point of the race. After the climb out of Buttermilk, I maintained my effort and gradually pulled away from our group of four. I learned in the coming few miles (via Lisa Holt putting in a 4-hour ride on her trainer so that she could cheer while working out, ha—thanks!) that I was now in fourth place, behind Tyler Sigl, Jared Burdick, and Dylan Bowman. These three, along with Ornelas, were the runners I expected to provide the most competition, so this was no real surprise. I kept rolling steadily but somewhat conservatively, careful not to overdo it. Eyeing my planned splits—which I had written on my arm in Sharpie—I knew I was more or less on pace for my 3:20 halfway split. 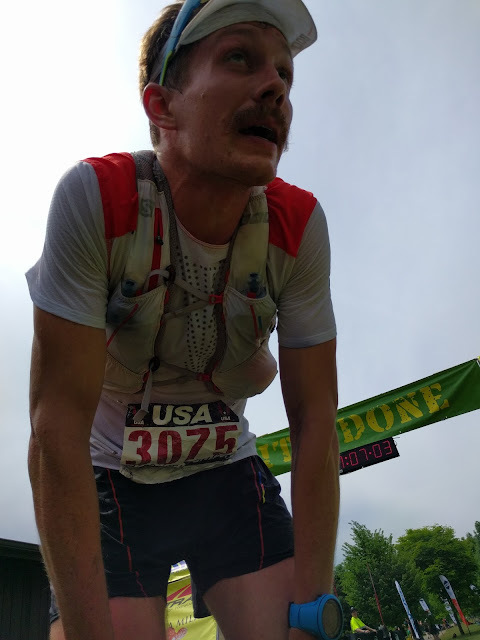 I found out at the turnaround that I was ~4-5 minutes back of Jared and DBo, but Tyler was way ahead, running a crazy first half of 3:06 (the CR was 6:47!). Barring a disaster for him, it appeared he'd win—but then, when you're running that fast, there is a potential for implosions of epic scale. Out of the turnaround, I got back to work focusing on being efficient and smooth as I could be. The third quarter of the race—the return to Buttermilk Falls—was probably the toughest stretch for me. Energy levels were low and the heat was starting to get to me. I kept drinking (I was doing half water and half Tailwind) and eating (fruit at the aid stations and pre-made tortilla/cheese/turkey wraps)—but still felt I was right on the edge. All of the diverted blood flow dedicated to trying to cool my body was making it difficult to digest food and difficult to run fast! I ground my way to Buttermilk as best I could, where I found out that DBo was ~6 minutes up on me and apparently not looking great. This gave me a sliver of hope and an injection of energy to lay chase. I was still having a tough time with the conditions, but just kept moving and managing things as best I could. 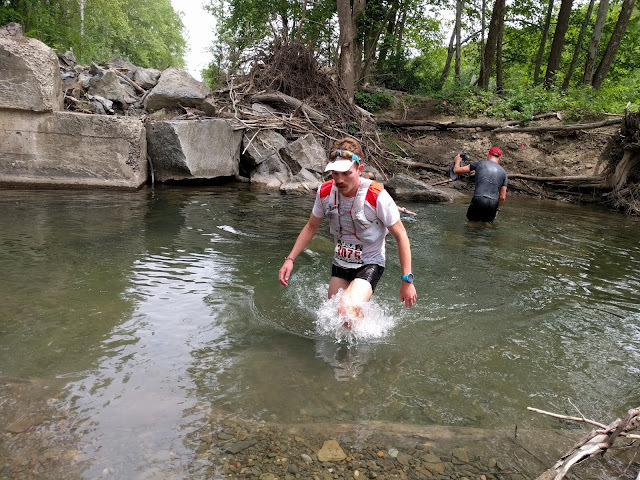 At Underpass, no one gave me a time gap, but I'd heard 4 minutes from Richard Bolt and Nancy Hobbs at the creek crossing a couple hundred yards earlier. I quickly moved through the AS w/ a water bottle refill, some fruit (oranges and strawberries), and a couple more strawberries for the road. As I exited Underpass, I glimpsed DBo through the foliage, no more than 30 seconds ahead—he must have taken a little longer at the AS than I did. I passed him within a mile or so on the rolling climb up the Rim Trail; he said he was cramping a bit and asked if anyone was behind us. I said I didn't think so (I hadn't seen anyone, but I didn't really know either). I tried to push this climb well, knowing that I needed to create some space in case DBo rallied. Hoping that wouldn't be the case, I took a glimpse over my shoulder after the final creek crossing a mile or so above Old Mill and less than 4 miles from the finish. And sure enough, there was DBo, stepping into the creek. I had maybe 30 seconds. This was the exact same position I was in in 2013, where a quick head check with four miles to go revealed a charging Jordan McDougal. I managed to hold off Jordan in 2013, but barely. Here I would be racing down the steeps stairs of the gorge yet again, desperately trying to hold position. This push definitely helped me run the last miles a couple minutes faster than I could have otherwise. Coming onto the final loop around the grass field, I finally knew that I had 3rd place locked up. As it turned out, DBo finished 5 or 6 minutes back—perhaps he took some time in the final AS or didn't know that I was so close just before that. Regardless, I was happy to podium for the third time at this race, especially given my conditioning coming into the race. I've now got a 2nd, and two 3rds. Men's Podium (R-L): 1st place Tyler Sigl, 2nd place Jared Burdick, 3rd place me! 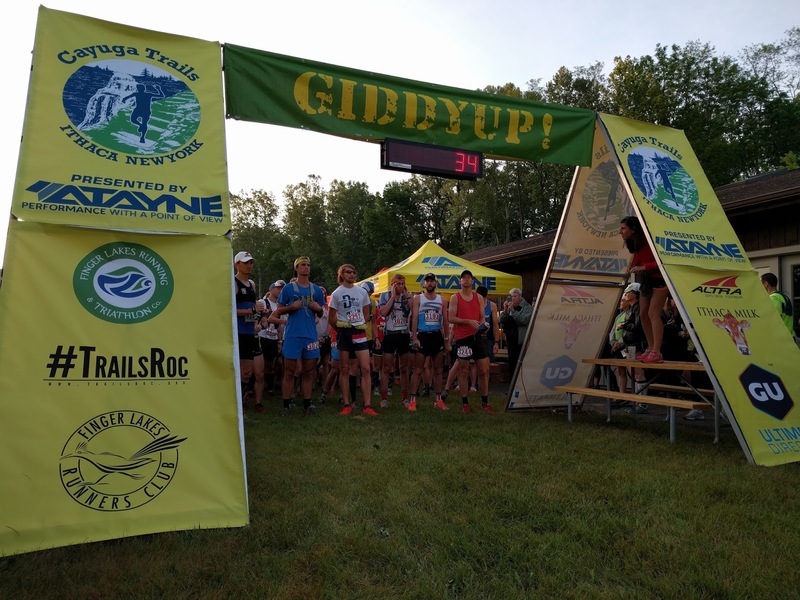 I'd be remiss not to put in a major plug for this race and for Ian Golden (the RD of Cayuga and a bunch of other cool events through his business Red Newt Racing). This is one of my favorite ultras, which is part of why I keep coming back (this is the first ultra race I've run three times). The course is beautiful, winding on varied terrain through the gorges surrounding Ithaca. The ultra community that is growing in New York and the Northeast is really cool, and I've enjoyed getting to know a lot of these folks over my years coming here. 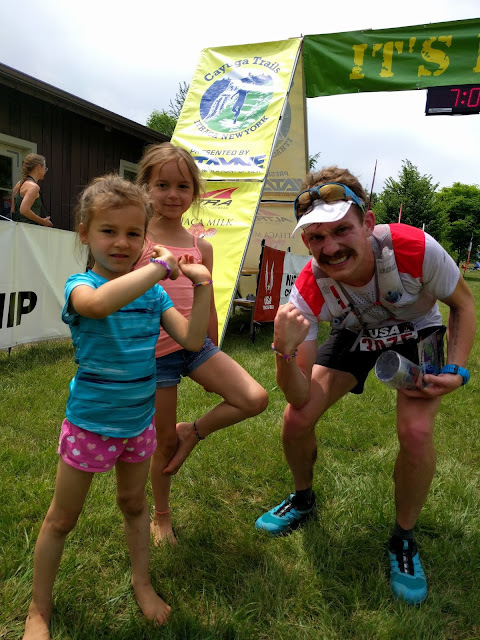 From pre- and post-race events at places like Ithaca Beer Co.; to the course design/volunteers/aid stations/etc. ; to the post-race hangout and awards (with great locally sourced food, beer, etc.)... Ian puts on a great event. If you're looking for a cool late spring /early summer 50 for your calendar next year, look no further! While some events or injuries may pull me away some years (Comrades comes to mind), I also know I'll be coming back to Ithaca to race this again. After all, gotta notch that elusive W! Quaffing those post-race brews... one of my favorite parts of ultrarunning! That's so best home blog for me. I get a lots of information from here. Perfect ! 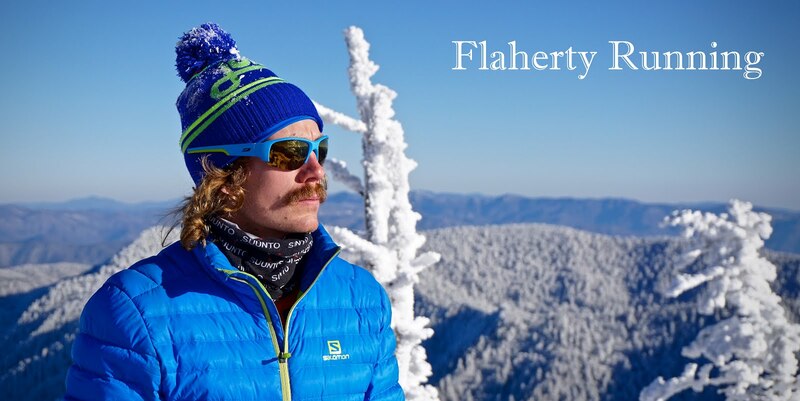 Congratulation on your win for running 50 miles. If I were you I would have slept after my 2nd mile. I don't have the strength.